The festivity season is here again and needless to say that people in India are all captivated in various traditional celebrations, welcoming the Hindu New Year. After the massive celebrations of Holi, individuals are observing the next primary set of festivities-- Chaitra Navratri 2019, also known as Vasant Navratri. According to the Hindu calendar, this year, Navratri falls on April 6, and the celebration will continue till April 14, 2019. Apart from all the puja rituals and traditions, Navratri Bhajans or Bhakti Geet have significant demands among the devotees of the Hindu Goddess, Maa Durga. And when we talk about bhajans, majorly one voice occurs in our minds-- Padma Shri awardee Anuradha Paudwal. Her melodious voice, especially in the spiritual genre of music has only won hearts, and no Hindu festivity is ever complete without her devotional songs. From Durga Chalisa to Durga Amritwani, listen to devotional aarti songs and celebrate Vasant Navratri. 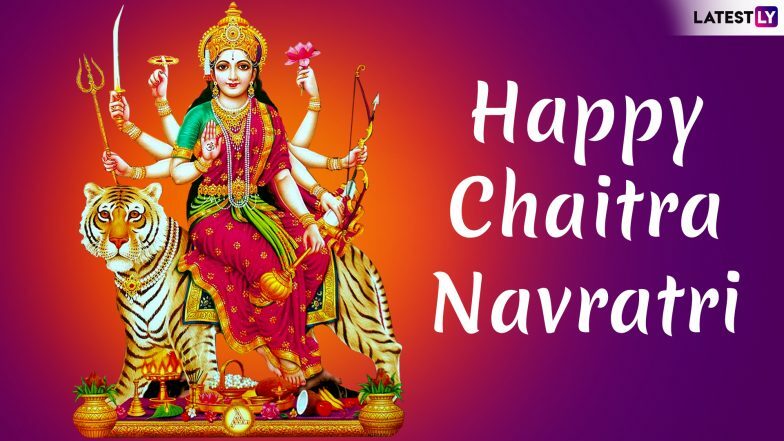 WhatsApp Stickers, SMS, Durga Devi Photos, GIF Images and Messages to Send Happy Navratri Greetings. As per the ancient scriptures, there are four types of Navratri celebrated in a year, but only two of them-- Chaitra Navratri and Sharad Navratri are celebrated with such enthusiasm. Chaitra Navratri connotes the beginning of the Hindu New Year. Navratri 2019, the celebrations of nine nights is devoted to Goddess Durga and her nine structures. The festivity is praised with dedication and immaculateness, everywhere across the nation. Since the occasion is so significant among the Hindu community, below we have accumulated devotional Chaitra Navratri songs by the Indian playback singer, Anuradha Paudwal. O Sheronwali And Other Bollywood Songs on Maa Durga You Can Play on The Auspicious Occasion. On Chaitra Navratri, devotees gather and sing Devi Bhajan as a ritual and seek Maa Durga's blessings to start the new year. In this video, Devi Bhajan is sung by Anuradha Paudwal, and the song is from the album, Durga Amritwani. This song is dedicated to Goddess Durga, who is also known as the destroyer of evil. To seek blessings during Chaitra Navratri, devotees sing spiritual songs unanimously. Navratri Ke Nau Din Aaye is sung by Anuradha Paudwal from the album, Maa Ki Mahima. According to Hindu mythology, chanting Durga Chalisa regularly is the most potent way to please Goddess Durga and get her blessings. This Chaitra Navratri, tune in to Durga Chalisa, sung by Anuradha Paudwal to create a spiritual setting. This video is a compilation of various songs sung by Anuradha Paudwal, and it is a mandate that you tune in during Chaitra Navratri 2019. There are a total of eight songs, each stating the significance behind the celebration of the nine nights and various structures of the Hindu Goddess Durga. Chaitra Navratri is a spring affair, which is celebrated typically in March and April. Hindi devotees refrain from eating non-vegetarian food, drinking alcohol and engage only in spiritual performings. Since each day is dedicated to nine different forms of Maa Durga, the rituals and offerings vary too. Have a blissful New Year, everyone.